Crown vessels, Sebaceous hyperplasia Crown vessels – cite! Crown vessels (message) Crown vessels – participate! Crown VesselsThis glossary term has not yet been described. Crown vesselsRadial serpentine or arborizing vessels at the periphery of the lesion that radiate towards the center but do not cross the midline of the lesion. sebaceous hyperplasia comprise linear, curved vesselscomma vessels - linear curved short vessels - dermal nevi monomorphous vessels: one type of vessel dominates with minimal branching, situated along the periphery and extending toward the center without crossing it, giving the appearance of a crown. Crown vessels are characteristic of sebaceous hyperplasiaThis glossary term has not yet been described. 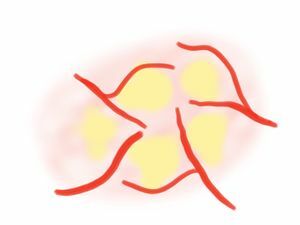 ; this pattern was seen in 83.3% of sebaceous hyperplasia with a PPV of 83.3%. Crown vessels may also be seen in molluscum contagiosumThis glossary term has not yet been described. .
↑ Argenziano et al. : Vascular structures in skin tumors: a dermoscopy study. Arch Dermatol 2004;140:1485-9. PMID: 15611426. DOI. ↑ Zaballos et al. : Dermoscopy of sebaceous hyperplasia. Arch Dermatol 2005;141:808. PMID: 15967945. DOI. ↑ Morales et al. : Dermoscopy of molluscum contagiosum. Arch Dermatol 2005;141:1644. PMID: 16365277. DOI. This page was last modified on 16 January 2019, at 22:10.